These wax tarts were provided by Satin Suzie Scents for reviewing purposes. Bernadette from Satin Suzie Scents sent me a box of tarts recently to try and I could not wait to get them in the warmer. 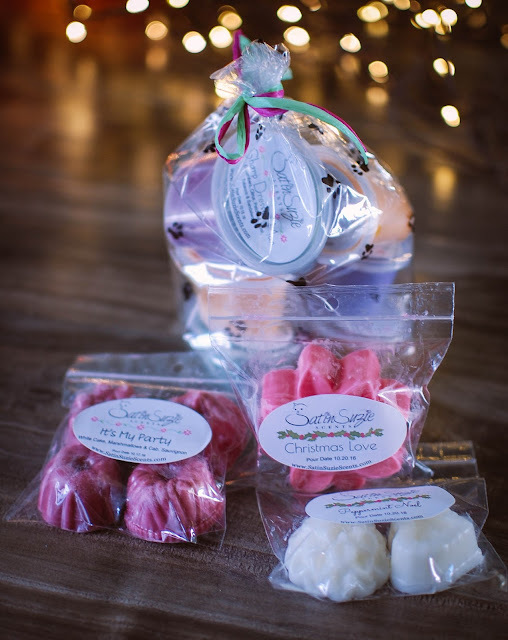 Her prices are very reasonable at $3.65 for clamshells and $1.60 for RTS scent shots and $1.70 for custom order scent shots (2 ounce shot cups). She uses a parasoy blend and has a nice variety of scents to choose from, as well as house blends, which I always appreciate. Some of her scents do have pop culture reference names which can be fun. 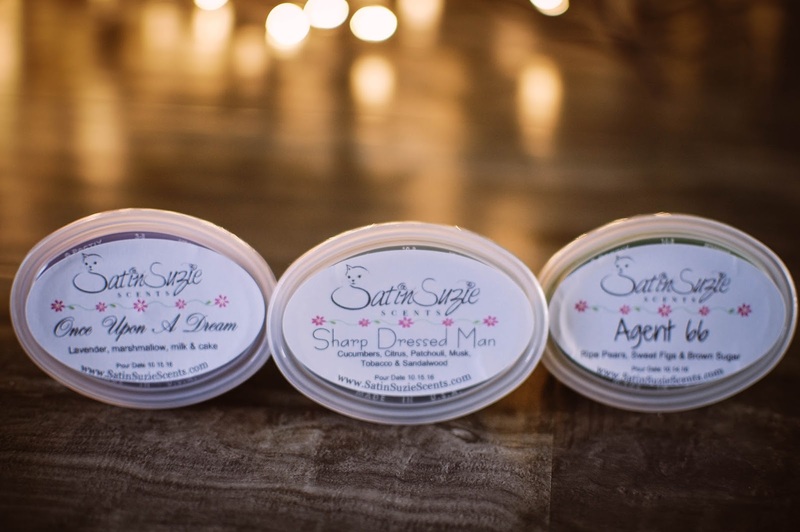 The labels are nicely styled with brand name, scent description, pour date and website included. Once Upon A Dream- Lavender, marshmallow, milk and cake. Herbal lavender with a touch of that steely coolness baked inside a vanilla cake and topped with fluffy mounds of marshmallow cream. A solid medium-strong scent in my bedroom. Sharp Dressed Man- Cucumbers, citrus, patchouli, musk, tobacco and sandalwood. The watery fresh aloe vibe of cucumber slices mellow out what would normally be a full fledged masculine cologne scent. It is kind of funny because I can see the Duck Dynasty guys smelling like this. She really thought this one through. Aquatic vibes from the marshy duck blind, a little tobacco, and musky beard. It works. Now I have ZZ Top in my head. Agent 66- Ripe pears, sweet figs and brown sugar. The normally cloying brown sugar and fig is injected with juicy nectar from the pears. A wonderfully brilliant combination. It melted with a medium-light throw in the kitchen. Pumpkin Pie- This reminds me of the Scent Appeal fragrance Pumpkin Crunch Cake I had eons ago. Spicy, bready, crunchy and hearty. A great scent to have on hand for Thanksgiving. Smoky Mountain Autumn- Leaves, bonfire and mountain air. The campfire smoke in this one is the most realistic one I have ever sniffed. Not sweet, not bitter, just pure embers and a hint of brittle leaves. 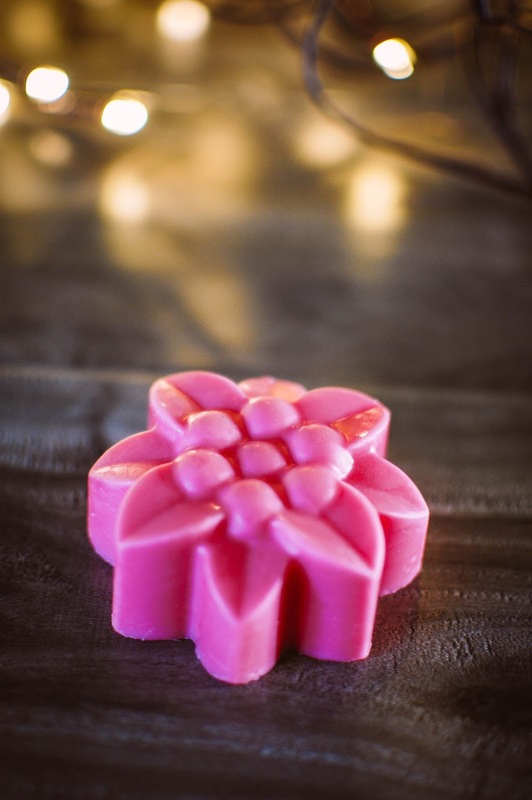 Nutmeg & Ginger- A comforting spicy fragrance full of gingerbread cookies and cakes. 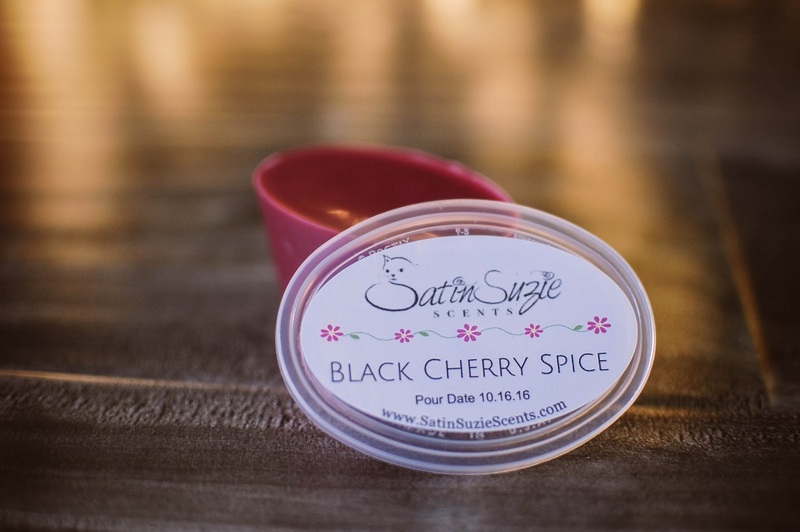 Black Cherry Spice- Features candy sweet black cherry syrup, like a soda fountain dream and just a teeny hint of spice. It is almost not detectable with that familiar fiery cinnamon but rather it smells darker and a little more deep than a traditional black cherry scent. 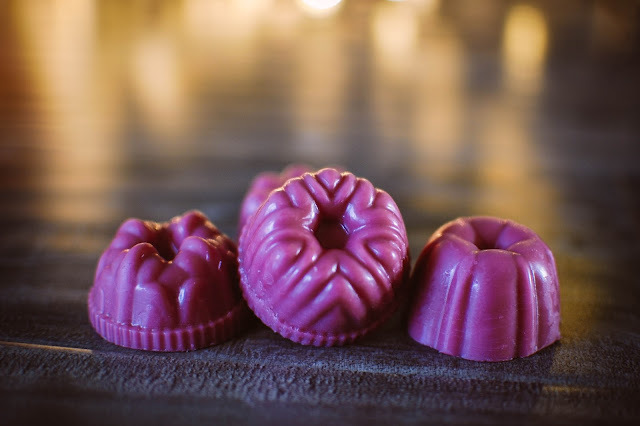 Mini bundt cakes in It's My Party, a blend of white cake, marshmallows and Cabernet Sauvignon. I mostly detect the grape juice flavor of the wine with a little swirl of creaminess. Ever had a Purple Cow scent? Kind of like that but a little more winey. 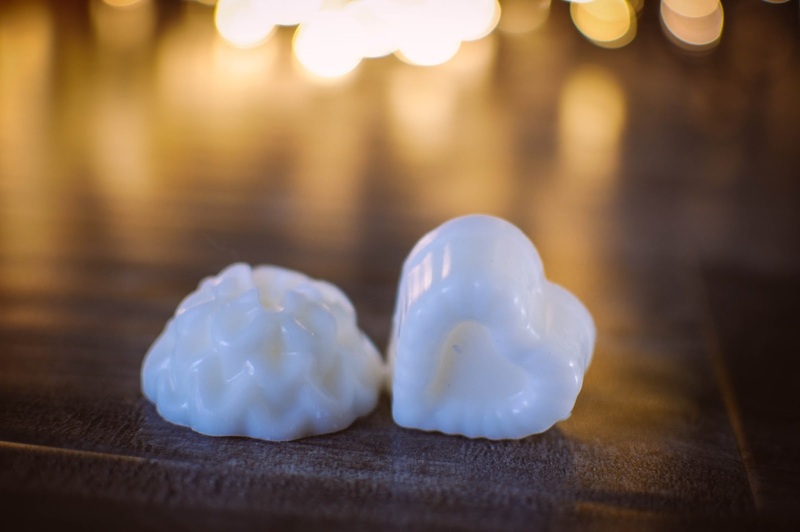 Christmas Love- Pine, cinnamon, nutmeg, clove, sugar cookie, brown sugar and musk. A Yankee Celebrate Christmas dupe. I don't believe I have ever experienced this particular Yankee scent. A dark, musky brown sugar and anise aroma fills my nostrils when I sniff this from the bag. Very different from the traditional Christmas scent. It melted sweet and full of brown sugar. I cut it in half and melted some in my kitchen warmer and some in my living room with a medium result overall. Peppermint Noel- Ahhhhh.... my precious. Sub zero freezing peppermint just how I like it. A slight creamy vanilla from the Vanilla Bean Noel, but only a hint. Perfect. I threw both of these little shapes in the bedroom warmer and got a medium throw. 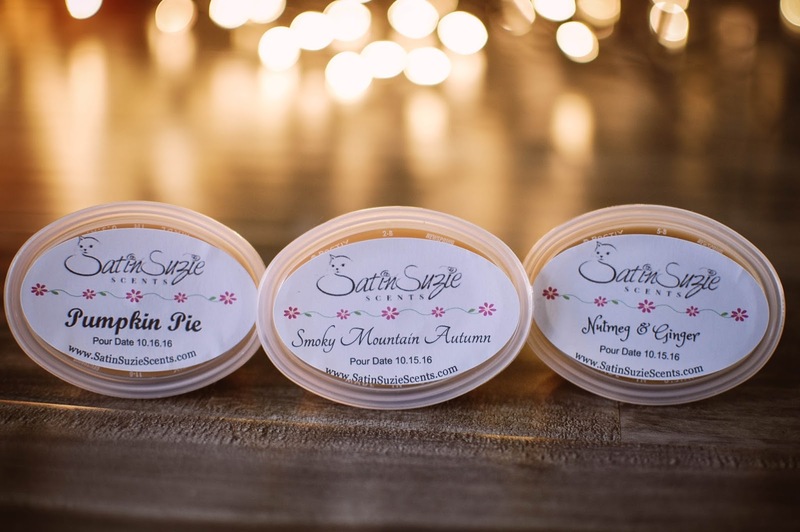 Overall I am very happy with these Satin Suzie Scents wax tarts and would purchase Peppermint Noel, Once Upon A Dream, Pumpkin Pie, Nutmeg & Ginger, as well as explore more of her Christmas scents and house blends such as Snow Day and Winter Woods. Ugh. Replied below you. Lol!! How cool!! Yes! I will be stocking up on Peppermint Noel. And I want to try a bunch more. I saw the sale but the rest of my funds are budgeted for gifts so I have to wait for a week. Can't wait to see what you got! Yes, the constant barrage of vendor announcements does get old sometimes. Agent 66 was a great one! Very unique to me and a fruit I can get on board with. Smoky Mountain Autumn will be one I buy again, because I gifted this one to a friend that I know adores fire scents. Bedroom is the room for mint for me!! I should melt it more out in the main house but I find I hoard them for my bedroom. And my mint drawer is woefully low. Like maybe a week's worth of mint left low. >_< Must restock soon!! I made my first order during the sale. 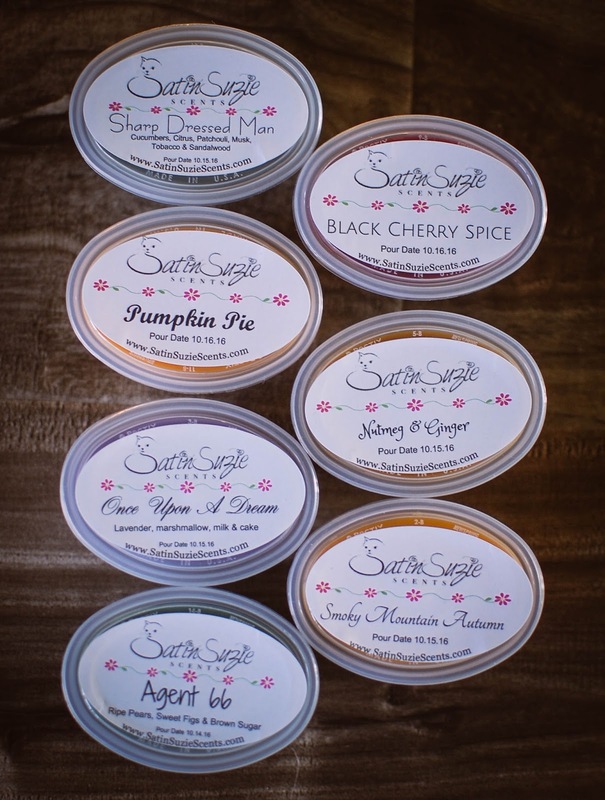 I ordered some of the scents you received and am even more excited now! I'm already impressed with her customer service. My order is supposed to arrive Sat. I'm shocked at how fast her tat is! Everything is amazing! There isn't a single scent that doesn't smell awesome and like it's supposed to lol. I got a sample of Christmas Eve that is super good! You'd love it! Snow day and sweet spruce are very nice pine scents. They are going to be perfect when it gets cooler here. Pine is another scent I'm loving this year. Shh...sleeping baby is a surprise favorite for me. It has baby powder as one of the notes and at times I really don't like powdery scents but this one is AWESOME! Jessica Rabbit is really good too. It's Strawberries, pound cake & creamy filled twinkies and her strawberry is a really good version. Some can smell really artificial and overly sweet to me but this is great! I'm excited to melt some of these soon. Bernadette suggested waiting 2 weeks to melt so I'm going to do that. They all already smell so good! Whoo hoooo!!! Love this! I will definitely grab those pine scents then. Jessica Rabbit might have to pop in my cart too. Glad you loved your smell goods Gina! 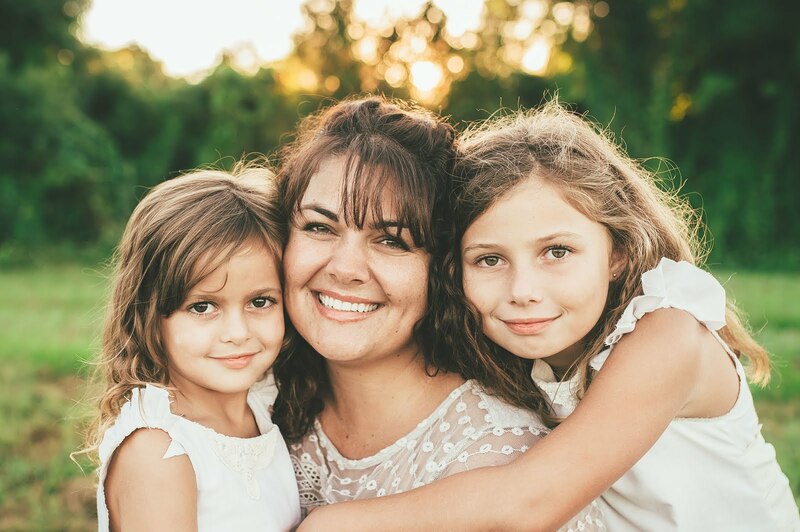 <3 And thank you for reporting back!